From 1/64-12/65 he was sick in hospital at Memphis, Nashville, and Louisville, KY, (hypertrophy of heart, gunshot wound of the chest), 1/65 in Convalescent Barracks No. 1 in Louisville, nearest relatives shown as Jane & Franklin Williams and residence Franklin, TN. 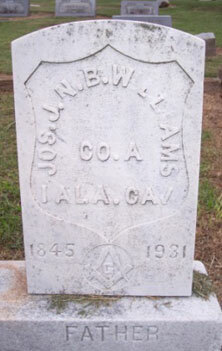 He was the brother of Alexander C Williams. Family legend concerning Joe's injuries reads, "A confederate spy was brought into camp and thought to be unarmed. Apparently, the spy pulled a pistol and sought to shoot Captain J J Hinds. Joe jumpedin front of Captain Hinds and took a bullet in the lungs. It cost Joe a lung but saved the Captain's Life." Picture submitted by Dennis Yerbey.